As a child, Marty Nichols knew he wanted to work in the medical field. 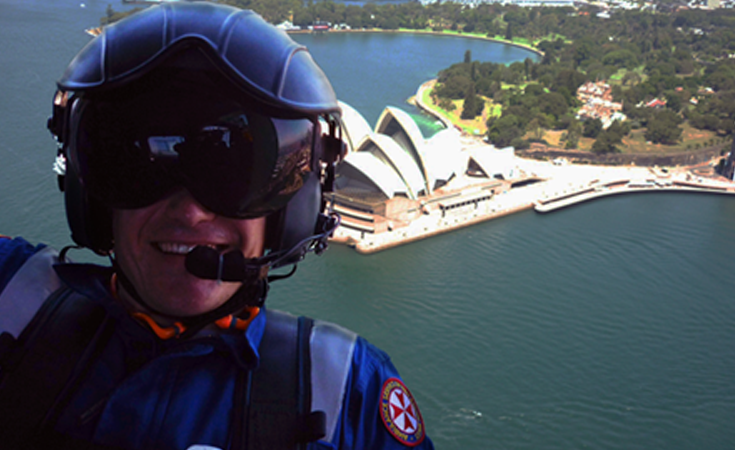 After obtaining not one or two but FIVE undergraduate and postgraduate qualifications with Charles Sturt University, Marty is now a full-time helicopter paramedic with NSW Ambulance based in Orange. He also works casually as an emergency department Registered Nurse, is a National Director for the Australian and New Zealand College of Paramedicine and also finds time to work as an adjunct lecturer for CSU’s School of Biomedical Science. As a paramedic, Marty gets to see the best and worst of people, while having an opportunity to positively influence people’s lives in the short term. At school I knew I wanted to do... something in the medical field. That led me to start at CSU (Bathurst) in 1999 studying a Bachelor of Health Science (Pre-Hospital Care). I chose CSU...because in 1999 CSU was the only university in NSW that offered a Bachelor degree in paramedicine. I chose to stay with CSU for my four subsequent degrees (Bachelor of Nursing, Graduate Certificate in Clinical Education, Master of Health Science and Master of Business Administration (Public Sector Management)) due to CSU’s expertise in distance education. I’m not the first in my family to attend university...my father has a Bachelor, Masters and PhD, so getting multiple degrees must run in the family! My best experience at CSU...was at the start and the end. I enjoyed O week and my first year as a full-time on campus student, as well as graduating! At university I was inspired...by engaging and committed lecturers. In my profession it is important...to have a good combination of knowledge, skills and attitude. You need a solid knowledge base and the ability to remain calm under pressure. Communication skills are essential. There is a variety of sub speciality roles that paramedics can perform. 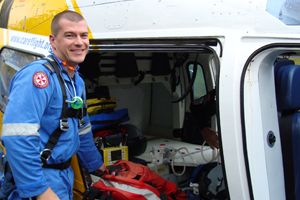 During my career as a paramedic I have also been a manager, educator, intensive care paramedic, flight paramedic and rescue/special operations paramedic. The best piece of advice I ever received...was from a lecturer at CSU who advised me to keep my resume up to date and to apply/interview for a job every year in order to be ‘in form’ for when your dream job is advertised. One last thing...like most people I never started with the goal of completing five degrees with CSU. However, after completing each degree I realised there was something else I wanted to learn or study. Often times this study involved a single subject per semester by distance. Without flexible distance and part-time delivery options I would have never completed any more than one degree.